Taking chances can be a good thing – that’s often how you discover what’s important to you and what you can achieve. The events that led us, individually, to where we are now – working together to head the US office of Touchwood PR – have involved paths of exciting (but often scary) uncertainty. For both of us, moving to Los Angeles involved quitting our jobs, leaving behind the lives we had built in Toronto, and moving to a place where neither of us were sure what the future held. This was not exactly an easy decision. We both asked several of our friends and family members what they thought, and received a lot of support for packing up and taking the road less traveled. Not every decision you’re presented with will involve moving to another country – it may be to take a chance on a new job, to switch careers, to leave or start a new relationship, or to try something you’ve never done before. Regardless of what the reason is and what decision you ultimately make, lingering and perpetually wondering ‘what if’ is a no-win game. It’s much better to live in the moment and fully embrace the choice you made. If you trace back events that led from one decision to another and ask yourself where you would be if you hadn’t taken certain risks, chances are that you wouldn’t be where you are today. For us – this would mean missing out on an incredible life in Los Angeles and an amazing job opportunity with people we feel honored to call our friends and colleagues. Our first project together as a company was this past TIFF. There, we collaboratively handled several US and international sales titles and, during the nights spent laughing and recalling moments of past and current festivals, we realized how lucky we were to have made the decision to be a part of the Touchwood team. In the end, our experience has taught us that taking the scariest risks and giving it your all can bring the biggest rewards and the greatest satisfaction. There is never failure in trying. P.S. 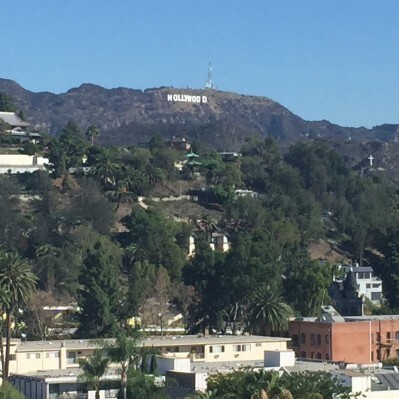 The photo included with this post is a view from our our new office in Los Angeles.